HighBridge Audio, 2012. Book originally published in 2002. 12 hours on 11 CDs. 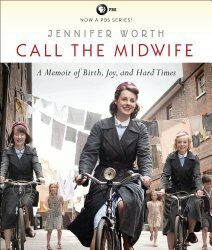 I’ve been watching the BBC series Call the Midwife on DVDs from the library. When I watched the special features after the second season, they mentioned how the producer had loved the book when she read it, and decided then and there to make it into a series. That was enough recommendation for me! Indeed, I found the book just as charming as the television series. Mind you, they romanticized some things in the series. I was a little disappointed not to hear about any romance with Jimmy. And if Chummy has a romance with the police officer she ran down on the bike, it hasn’t happened yet. But in some ways, it’s more interesting, because it’s all true. Jennifer Worth was a midwife in the East End of London in the 1950s. It was the beginning of the National Health Service, and in the past, pregnant women were dealt with by amateurs and charlatans, with a lot of deaths. As it is there’s plenty of poverty and eye-opening situations, and they make riveting listening. Mind you, this is not family listening. The part where she describes the past of the young prostitute is particularly graphic. However, it also includes more about the restoration of Jennifer’s faith than the series does. The author clearly had a deep love for the people of the East End and communicates that love to the listener. I was happy to see that my library owns two more volumes on audio CD.